Turning wood into marble, metal into wood, one dimensional into three dimensional; these are all "tricks" of the trade for the painters of the Architect of the Capitol (AOC). "We make a lot of things look like something they are not," said Cori Wright, assistant supervisor painter and decorator for the Capitol Building (and 2012 Winner of The Washington Post "Peeps Show" — dioramas made from Peeps marshmallows). "Or we make something that has been put into a space disappear," adds AOC "rookie" decorative painter, Ben Roberts (pictured in cover photo), who joined the AOC Capitol jurisdiction this spring. Roberto Duglio, AOC Capitol decorative painter, creates a "marble" fireplace from wood through skilled application of the right colors and design. The men and women who comprise the AOC painting craft across Capitol Hill (including the Senate, House of Representatives, Library of Congress and Supreme Court) are master illusionists ensuring the buildings inspire all who visit with their grandeur and beauty. It is their responsibility to create unique, decorative surfaces, and artwork that blends seamlessly into the historic and modern spaces across the 17 million square feet of buildings under their care. "These buildings really are our American Sistine Chapel," said Dean Kalomas, AOC Library Building and Grounds decorative painter for the past 18 years. "I love it here." 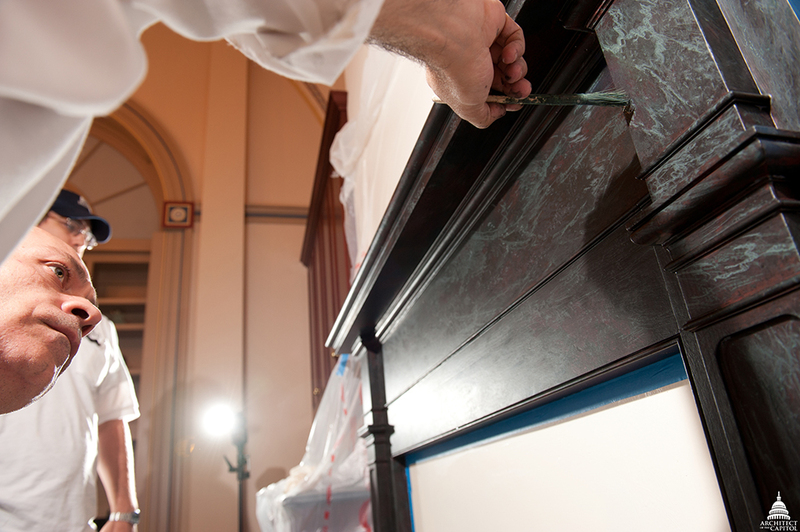 The AOC painters use solutions designed to preserve historic details or to restore decorative surfaces. They remove old paint from interior and exterior surfaces of buildings by scraping, sandpapering, using blowtorches or applying liquid paint remover. In addition, they use steam strippers to remove old wallpaper and repair walls by placing putties into holes and cracks. They restore the spaces in a manner that ensures that the color, designs and textures are unchanged. "Every building leaks; the bigger it is, the older it is, the more it leaks," said Kalomas. This leaves plenty of repair and maintenance work for the AOC's paint shops. And there are numerous "big and old" offices on Capitol Hill under the care of the AOC, including parts of the Capitol building dating to 1800 and the two oldest Congressional Office Buildings, Cannon and Russell, that are more than 100 years old. Tools of the trade include the use of materials to create decorative finishes such as stenciling, color glazing, marbling, lettering, striping, stippling and graining. In addition, they use artist brushes for intricate painting and decorative work. 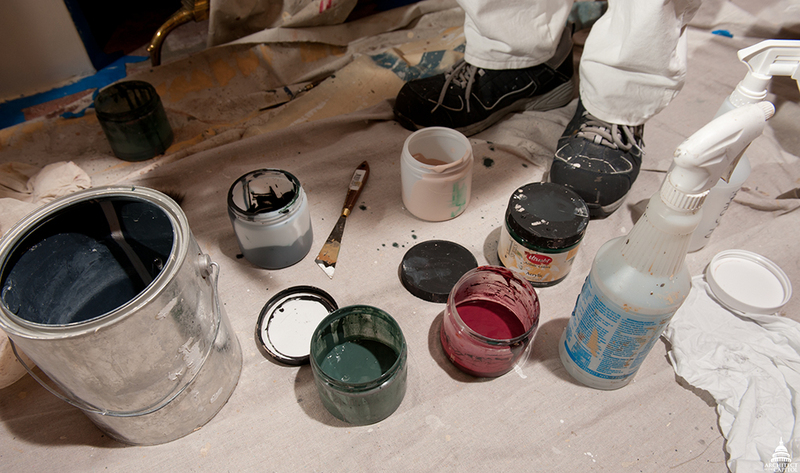 They also do "straight" painting, staining and varnishing by brushing, rolling or spraying. 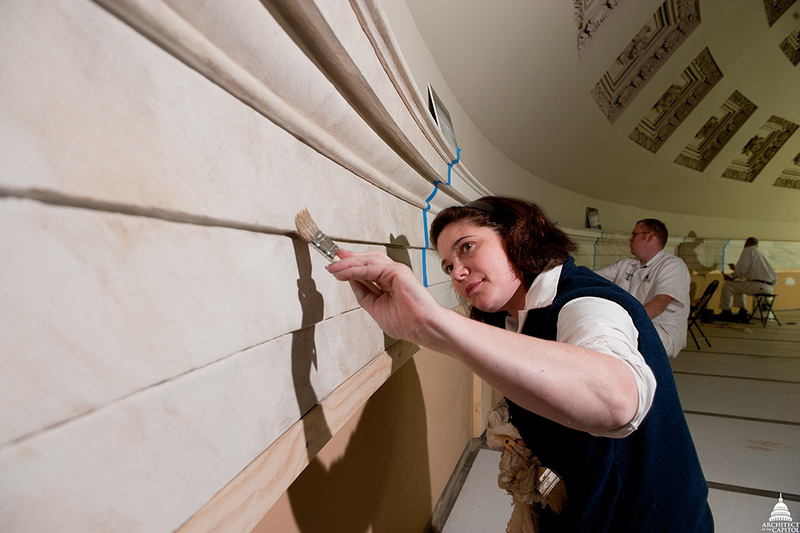 Claire Sharp, AOC Capitol decorative painter, helps restore the Old Senate Chamber using a faux marbleizing technique. One of the methods practiced by the AOC decorative painters is the ancient art of trompe l'oeil (pronounced trump loy), which requires meticulous attention to detail on the part of the artist. "Trompe l'oeil means 'deceive the eye' and that is literally what we do," said Kalomas. The proper sizing of every detail, nuance of light and gradation of color must be skillfully incorporated in order to make the two-dimensional work appear to be three-dimensional. While the art of trompe l'oeil is ancient, some of the methods now employed at the AOC are completely modern. The AOC Capitol paint shop has been at the forefront of the use of new tools such as the use of computer-aided design (CAD) and graphic design software for development of stencils and other intricate designs. "Before we used to use standardized stencils and make them fit," said Wright. "Now we create customized stencils to fit the space and then are able to print them." A special printer cuts the design into a vinyl stencil, allowing what used to take four hours to cut by hand to be printed in minutes. "Not only is it more accurate, but it’s more efficient and allows us to easily make modifications to the design if needed." What's the greatest compliment for the AOC painters? Having their work go unrecognized. 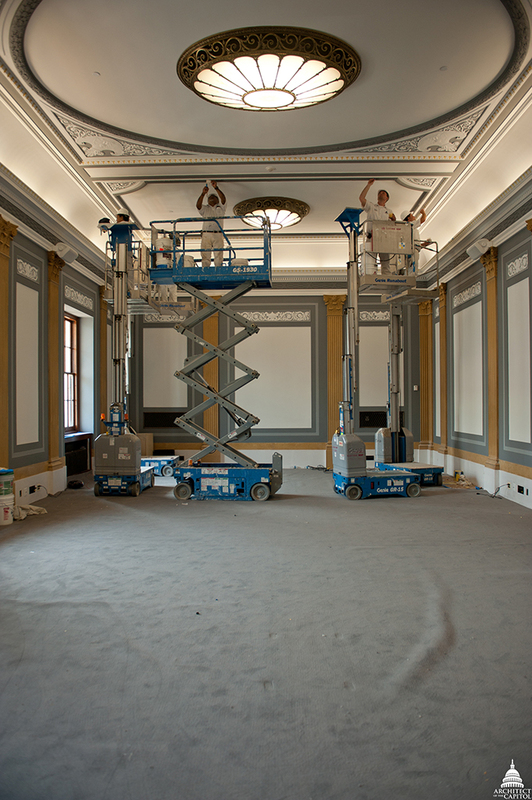 Timothy Steadman and Charles Taylor, AOC Senate painters, carefully apply gold leafing within a Senate Committee room. Jack Sypult, supervisor of the Senate Paint Division, joined the AOC as a painter out of high school and has been with the AOC for the past 30 years. 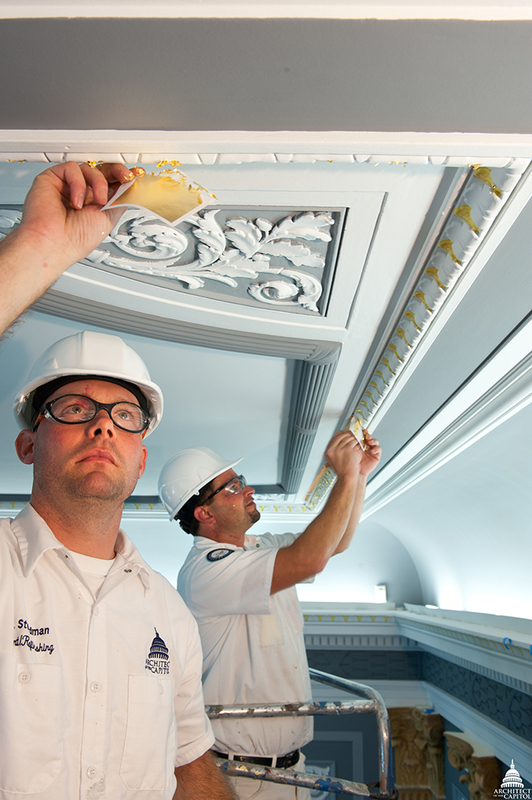 He and his team have been steadily making renovations to committee rooms in the century-old Russell Senate Office Building by employing the crafts of marbleizing, gold leafing, staining and straight painting. From marbleizing elements in the beautiful Kennedy Caucus Room to restoring antique furnishings in senators’ offices, the work of Jack and his team is "unseen" across the Senate buildings. "Most people don't recognize it as faux marble, unless they look real close and see a marble electrical outlet cover — then they might wonder," said Sypult. One of Wright's favorite stories involves a metal security door outside the House Chamber that is painted to look like an old mahogany door. "I was finishing the door when a Member of Congress walked by and said, 'Why are you painting over that beautiful wood door?' I just laughed to myself knowing that we did great work." This story is also published in the Summer 2012 issue of AOC's Foundations & Perspectives magazine.